From the Promenade in Edina, MN, the new paved trail system along the Nine Mile Creek watershed is fun to explore. 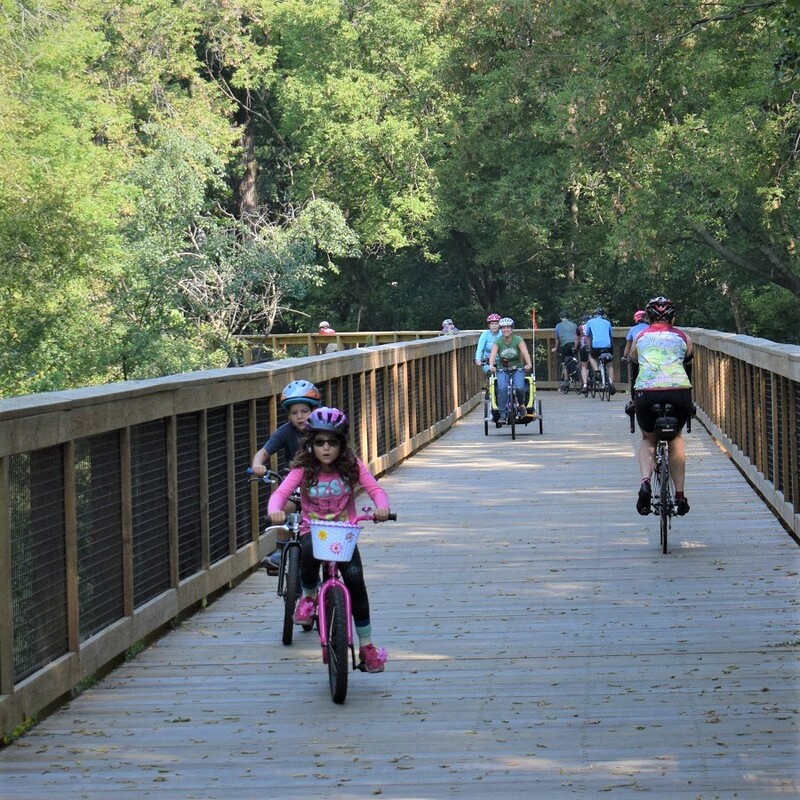 Pedaling west, you can safely ride over two freeways and connect to another regional trail hub in Hopkins. Along the way, this new corridor utilizes several wooden trail structures to straddle the bed of the creek giving you a birds-eye view of nature. Pedaling east out of Edina the trail takes you to the Minnesota Valley National Wildlife Refuge. Either way, it is a fun place to ride for the entire family. You can also connect to the Minneapolis Chain of Lakes trail system for a loop of the south metro. 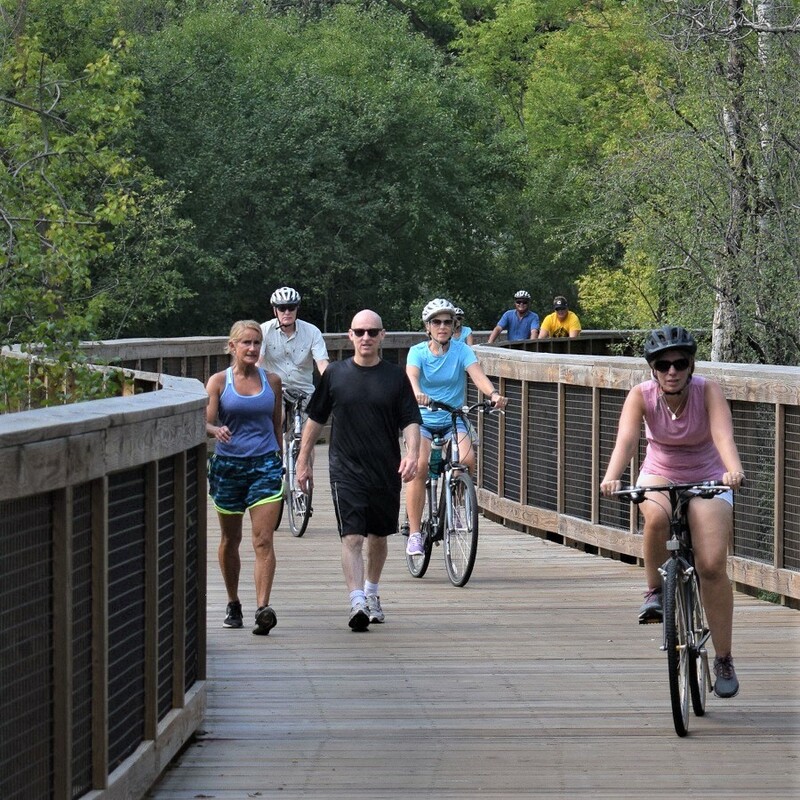 Rider and walkers alike enjoy the wide wooden trail structures that follow Nine Mile Creek through Edina. This 15 mile, Three Rivers Park District Trail is a 10-foot wide asphalt path with several wooden bridge sections that welcome walkers, bikers and others using non-motorized transports. Venturing west out of Edina there are so many places to explore with this new section of the trail over the Nine Mile Creek watershed. With fall and winter soon approaching get your bike, skis or walking shoes and head outside! After leaving the Edina Promenade, the trail wanders through Fred Richards Park. Riding through Fred Richards Park, a part of Nine Mile Creek, in Edina, MN. Once a par 3 golf course this park is now an urban green space welcoming you to the next several miles of your trail adventure. At the trail bridge over Highway 100, the actual Nine Mile Creek comes into view. Now the trail meanders above its namesake creek, on the elevated wood bridges above the wetlands and woodlands, in Edina. Along the way, you may want to stop and enjoy the wildlife that makes their home here along the creek. From Edina to Hopkins, by trail, it’s about eight miles with 1.7 miles of wooden boardwalk structures along the way. Rolling through Edina on Nine Mile Creek Trail is fun to explore. If it’s an out and back bike adventure, add another mile on the Cedar Lakes Trail (east) for a treat. Stopping at the Hopkins Depot for an ice cream cone or cup of coffee is the perfect treat before heading back. Sometimes, the journey is the reward, that is definitely the case here. It is approximately seven miles from the Edina Promenade to the Minnesota River. On this section, the trail passes through the city Richfield and connects to the north/south Nokomis-Minnesota River Regional Trail. The trail makes it easy to stay off busy streets. Just north of the Mall of America, both cyclists and pedestrians can safely cross the 494 Freeway and follow the trail south, through Bloomington, to the Minnesota River. 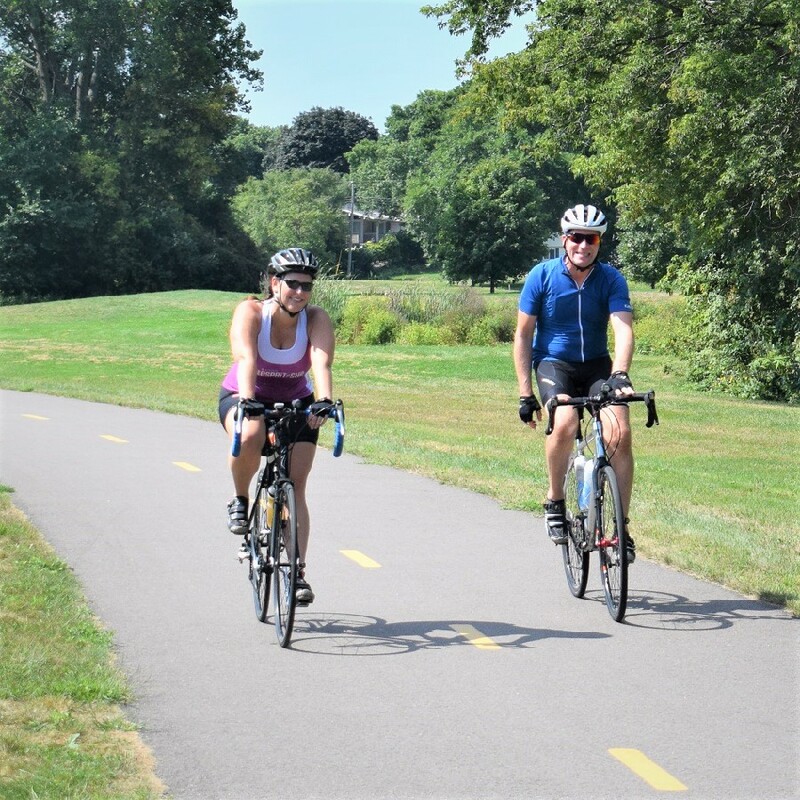 To the north, the Nokomis-Minnesota River Regional Trail users can easily reach Lake Nokomis and the Grand Rounds Scenic Byway in Minneapolis. Other points of interest in this area include the Minnesota Valley National Wildlife Refuge and Fort Snelling State Park. For your next bike adventure here use the Explore Edina Bike/Hike Map, featuring the new Nine-Mile Creek Trail. On this map, you will notice several trail access points. A favorite gathering point for me is parking near one of the retail centers, north or south of the Edina Promenade. Here you will find ample parking and several restaurant options for that appetite you are sure to acquire on your ride. For a place to stay when visiting Edina check their lodging options here. 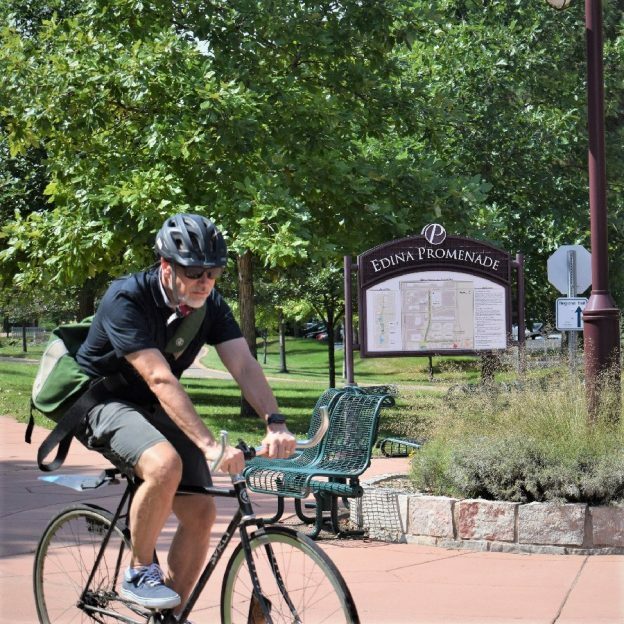 Edina residents and visitors now have access to a new, dockless bike service. You simply download the Lime app. All rental bikes are GPS and 3G-enabled, making it simple for riders to find, unlock and pick up a nearby bicycle using the iOS or Android smartphone app. The Nine Mile Creek Trail through Edina works well for all ages. 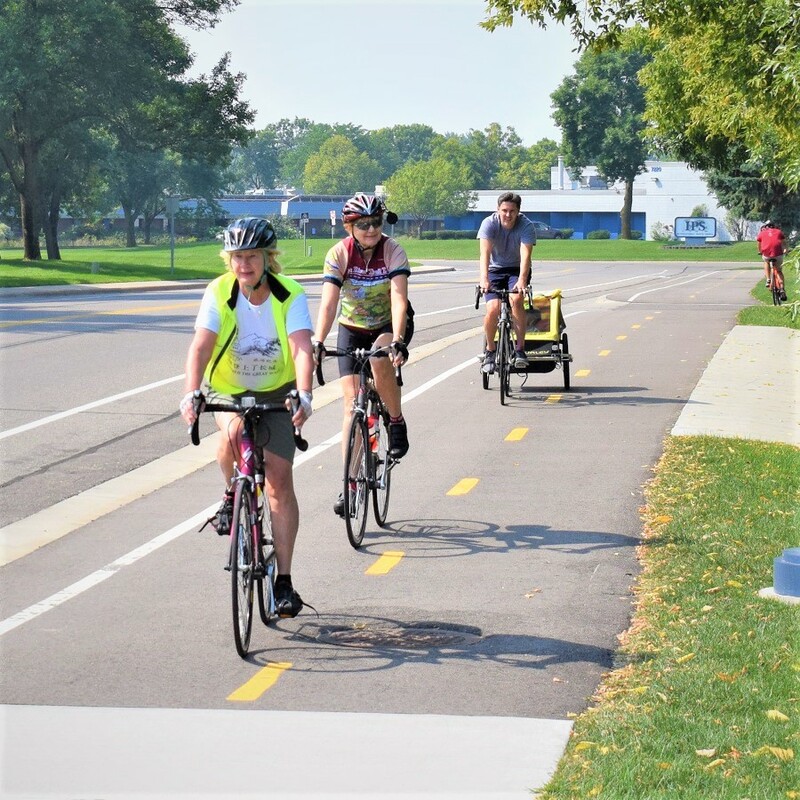 With many bike-friendly street routes, Edina is recognized by the League of American Bicyclists as a bronze level Bicycle Friendly Community. This entry was posted in Destinations, News and tagged Bloomington MN, Centennial Lakes Park, Edina MN, Edina Promenade, Explore Edina, Fort Snelling State Park, Free Bike Map, Galleria, Hopkins Depot, Mall of America, Minnesota Valley National Wildlife Refuge, Nine Mile Creek Trail, Richfield MN, Southdale Shopping Center, Three Rivers parks Trail on September 9, 2018 by Russ Lowthian.